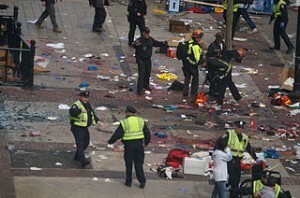 One year after twin pressure cooker bombs detonated at the Boston Marathon bombings, many questions remain. Why did federal authorities miss an opportunity to act on a warning from Russia that bombing suspect Tamerlan Tsarnaev was becoming radicalized? How much of a role did his younger brother, Dzhokhar, play in attack? Would the brothers have launched an attack in New York? “The obvious one is the motivation and how could two young men who were in a country that, from all appearances, was very good to them end up this radical,” former Boston Police Commissioner Ed Davis, who helped lead the investigation, told the Associated Press. The April 15 bombings killed three people and injured 260 more. At least 16 people lost limbs, the AP wrote. Posted: 4/15/14 at 9:36 AM under News Story.